How's The Josh Memes: Part Of URI Movie Memes Meaning | Wotpost. 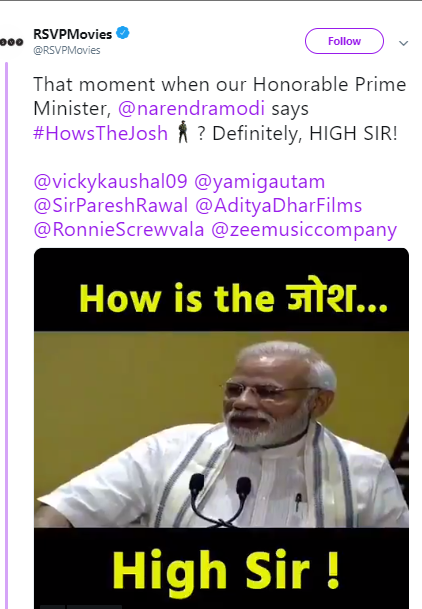 ‘High Sir’, mostly written as response to the question ‘How’s the josh (enthusiasm)?’, also used to explain the level of excitement and dedication towards a particular task or situation. It is a phrase that is linked with any situation only to get ‘High Sir’ as the response. The complete dialogue or catchphrase, ‘How’s the Josh? ‘High sir!’ is a statement from a Bollywood movie URI- The Surgical Strike which was released on 11th Jan, 2019. 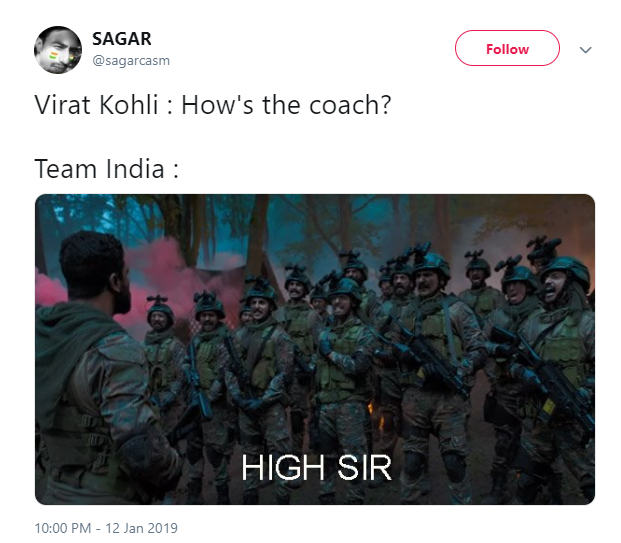 The meme originated from the specific scene where the lead- Vicky Kaushal asks his team before entering the enemy lines about their level of enthusiasm, with the question, ‘How’s the josh?’, to which the team responds, ‘High Sir!’. This dialogue or catchphrases can be seen widely used in jokes and Indian memes intended to ask the exact emotion from a person or group. The clip quickly went viral. And as people flocked to the theaters to watch the movie, the views on the video kept on increasing. As of now, the video has 4,406,037 views. 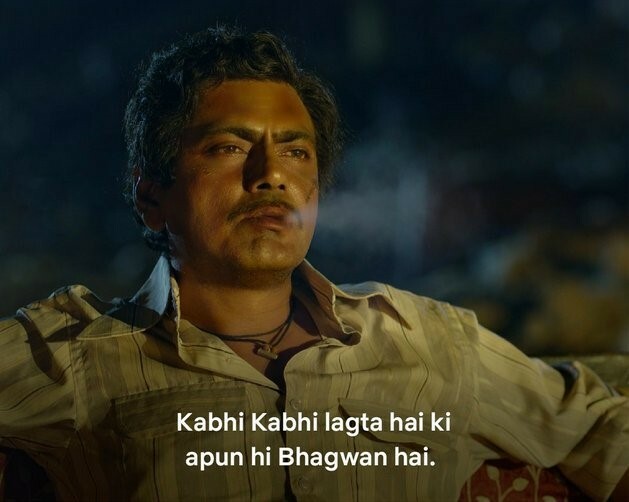 However, the first meme that used the catchphrase was uploaded on 13th Jan, 2019 by a user called [email protected] (image below), which was used in the context of Indian cricket team. 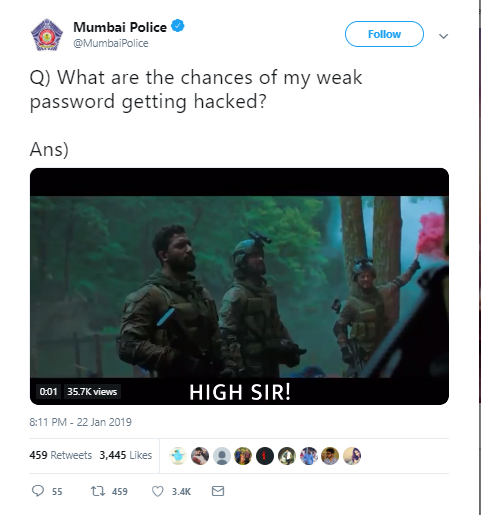 The spread of this catchphrase was quick and after the release of the movie, Nagpur city police came up with a creative meme that mentioned the same catchphrase. 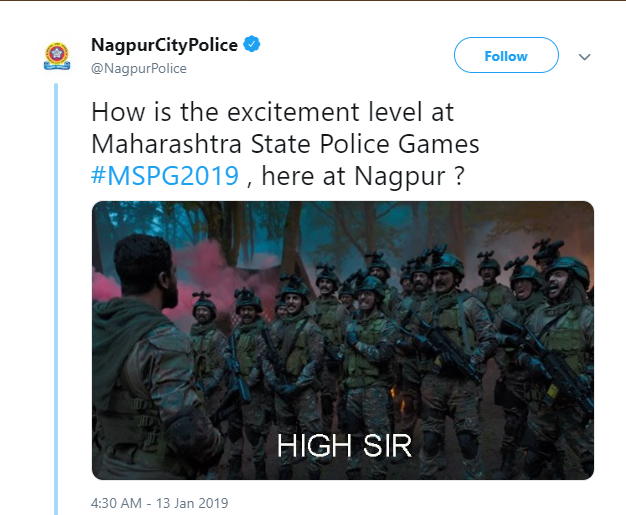 On 13th Jan, 2019 NagpurCityPolice✔@NagpurPolice tweeted a meme from their official account (shown below) with reference to the enthusiasm level of the policemen taking part in police games. On 19th Jan, the catchphrase was first used by RSVPMovies✔@RSVPMovies which mentioned Prime Minister Narendra Modi using the same dialogue (image below) to address the audience. “How’s the josh?” at the inauguration of National Museum of Indian Cinema in Mumbai, and ask about their level of enthusiasm, to which the audience responds with “High Sir”. The tweet has gone viral on social media gaining thousands of views and retweets. On 15th January 2019, a Facebook page called Bollywood Memers uploaded a meme trolling Bollywood celebrity Varun Dhawan. 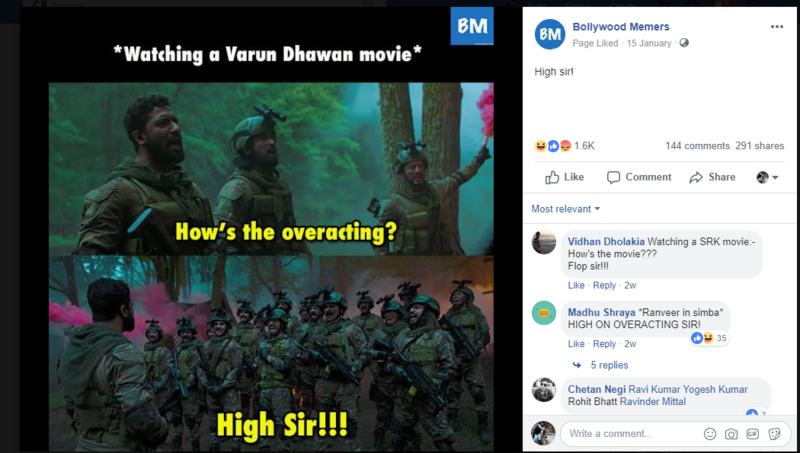 The meme was made on the same template build on the overacting skills of Varun Dhawan in his movies, for which the response is ‘High Sir’ (image below) The meme gained around 1.6 K views, over 144 comments and 291 shares so far. Bollywood [email protected] page has over 1.3 Million followers. The same post was shared by a Facebook page [email protected]. 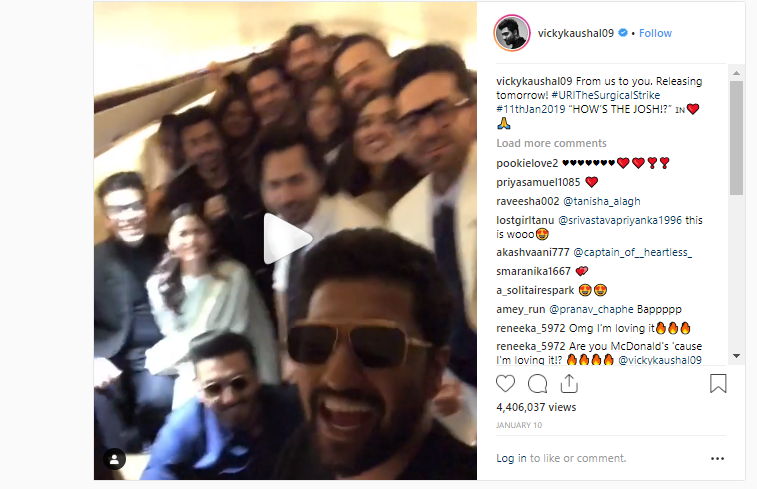 On 16th Jan 2019, Memes of India posted a video meme on Vicky Kaushal after meeting all the torrent downloaders – that has over 200 views till date. (image below). They also uploaded the torrent version of URI-movie in which the team requests users to watch the movie in theaters. Instead of downloading it on torrent, like they attempted. The video has over 1.5 K views and 31 shares. 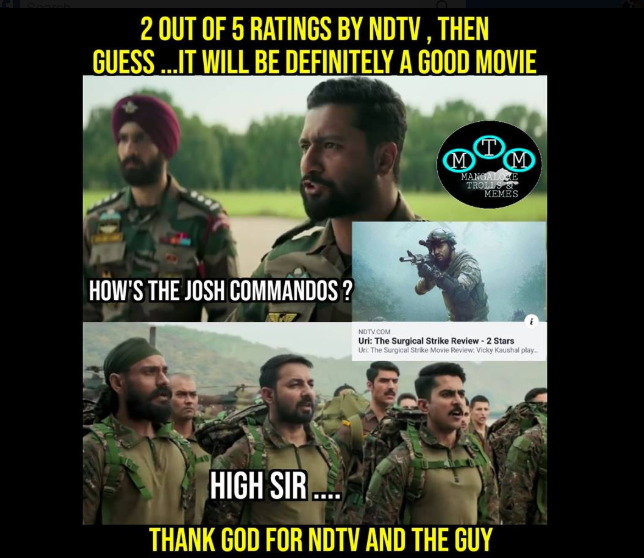 On 17th January, a Facebook page Mangalore Trolls & Memes uploaded a meme that mocked the film reviewers working at NDTV channel. 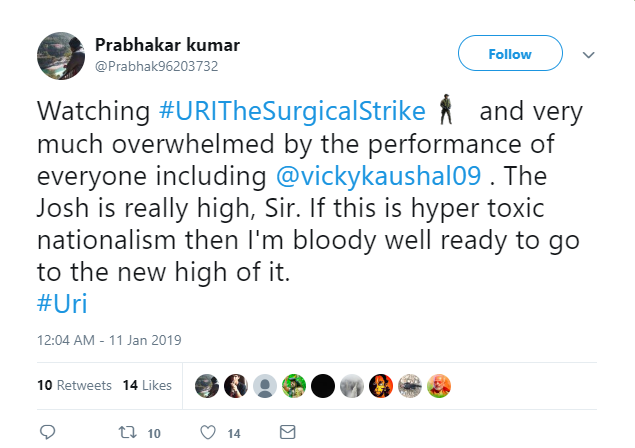 They quoted the catchphrase about the kind of enthusiasm audience had regarding the movie URI- the Surgical strike (image below) This closed group has around 8.5 K followers. 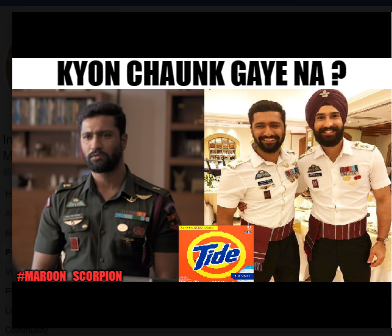 Indian Military [email protected], a community of around 226k followers, also posted a meme for URI, using Tide detergent as the prop- (image below). It received around 300+likes. On 22nd January Bollywood memers shared another meme on its page(shown below) that was also shared by another Facebook page LOLism. It was about the game Ludo and how the player feels when he loses his goti’(pawn). It received over 3.3K views, 1.6K comments and over 606 shares.